After a pair of introductory episodes that established a promising new TARDIS team amid only so-so adventures, the Doctor and Bill finally get a story and a script worthy of them with Sarah Dollard’s brilliant “Thin Ice.” There’s much to celebrate about this episode, but more than anything else is just how much watching it made me smile. Peter Capaldi and Pearl Mackie are a brilliant comedic double act, with the Doctor especially getting a ton of great lines. Their early exchange about the temporally deleted companion Pete has fun with what could otherwise be standard companion questions about the perils of time travel. The Doctor gets in another round of protestations about how the sonic screwdriver is totally sonic and totally a screwdriver, seriously. His ongoing obsession with working out the coin trick is enough to distract him from the business at hand, while he’s his usual ingenious self getting the foreman of the workhouse to reveal everything under the guise of protecting secrets. There’s a long wind-up when the Doctor tells Bill that he must do all the talking with Lord Sutcliffe, as this delicate situation calls for diplomacy, but the punchline of him immediately punching the odious noble is all worth it. Throughout, “Thin Ice” is effortlessly fun in a way the show hasn’t been in a long time. And, in fairness, the show hasn’t necessarily been going for fun recently, with season nine in particular drawing power from the more complex, serious stories the show could tell with a (by new series standards) long-tenured Doctor and companion pairing. But an episode like this illuminates why self-conscious “romps” like, say, “The Return Of Doctor Mysterio” rarely work. Doctor Who can’t be all sugar rush, as that gets wearing after a while, and it cuts against one of the show’s core strengths: Its ability to change tones on a dime. And my goodness, is there some tonal whiplash in “Thin Ice.” Remember the bit where the Doctor is defending the honor of his stolen sonic screwdriver? Yeah, that’s followed a couple minutes later by the gruesome death of a little boy, which the Doctor himself seemingly ignores in favor of retrieving his screwdriver. Such sudden shifts between light and dark could undermine both aspects of the episode, but Dollard’s script is nimble enough to make keeping the audience off-balance into an asset. That can only work if the actors are confident enough in their performances to serve as an anchor for the various tones, and Capaldi and Mackie prove up to the challenge. 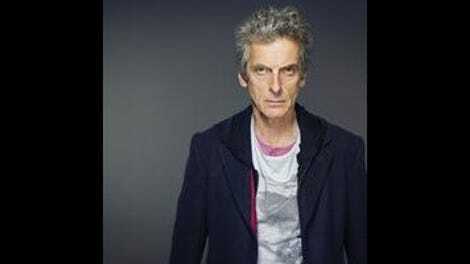 Capaldi is the subtlest performer of the four new series Doctors. His gift for underplaying moments eases the transition between moments of comedy and drama because he never goes too far in either direction, so it’s no great challenge to accept his acting choices as those of a single, coherent character. Even when called upon to make his big Doctor speech about human equality, he goes small. Capaldi can chew the scenery with the best of them when it’s called for—his speech about war in “The Zygon Inversion” is that defined, and it might be my favorite Doctor monologue in all Doctor Who—but he plays that moment with a quiet sadness that he should even need to explain this, along with a resolute certainty that he must. When season eight presented this incarnation as a stripped-down, back-to-basics version of the Doctor, it still felt like an affectation of its own, with whimsical quirk traded in for a performative aloofness. Here though? Capaldi just is the Doctor, and it’s brilliant. Mackie too shines in what proves to be a showcase for Bill. Her comic timing is a good match for Capaldi, bringing out Bill’s sense of humor without it feeling like she’s an actor trading wisecracks. This episode is also the first instance where Mackie is called upon to play the hallmark scene for any new series companion: the scene in which she assures a scared child that all is going to be okay. In a nice little twist on this standard scene, the girl appears unconvinced by Bill’s promises, asking what she contributes to the operation. Bill is still learning what it means to be a companion, with the Doctor explicitly still positioning himself as tutor, but both Dollard’s script and Mackie’s performance present Bill as someone whose mistakes are those of inexperience, not naivete or foolishness. What is perhaps Mackie’s foremost task is a quietly difficult one: Play Bill as a real, average person reacting to the alternately fantastical and traumatic events unfolding around her. As Bill herself points out, it was possible for her to exist at a certain detached remove in “Smile,” given the deaths didn’t happen in front of her (or, in the climax, happened too fast for her to process) and perhaps the generally futuristic setting. No such distance is possible in “Thin Ice,” as she witnesses firsthand the death of a little boy. Perhaps my droningly encyclopedic knowledge (more on that in a second) is failing me here, but I can’t think of a previous story devoting so much time to a companion processing the first death they witness. The episode is in a tricky spot, as Bill’s reactions are the normal, healthy ones under any other circumstance, but her grief and outrage are poor fits for the Doctor Who universe. The episode first has the Doctor be right in the wrong way, with him coldly informing Bill that her reactions are neither logical nor practical, but eventually Bill and the audience both learn that of course the Doctor has time for nothing but outrage, whatever he might claim. Bill’s anger with the horrors unfolding around her and frustration with the Doctor are important character beats, but the episode can’t afford to get bogged down in just these feelings. Mackie conveys a great deal, with shades of defiance and begrudging understanding, when she tells one of the urchins that she has moved on and is working with the Doctor again. “Thin Ice” doesn’t shy away from how racism would necessarily inform the travels of a companion of color in the Regency era. 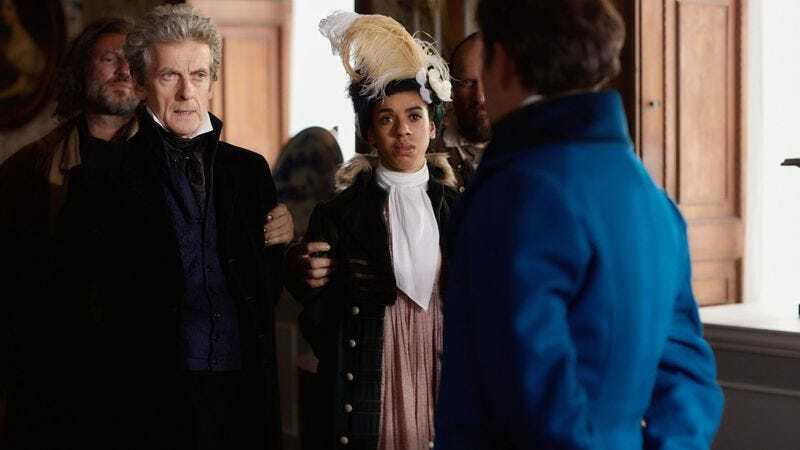 The episode follows the precedent set by previous new series stories with a double-barreled approach: The casting is diverse in a way that might more accurately reflect 2017 than 1814, but the episode doesn’t pretend the period was some post-racial utopia. This is the best of both worlds: Nobody is erased, but the episode doesn’t let the time period off the hook for its bigotries. Now, one can go too far in assessing a show based on how well it accords with a particular sociopolitical project, even if it’s one I’m hardly alone in seeing as a moral imperative. After all, if I judged shows purely on how well they accorded with my worldview, the only television a whinging lefty like me could ever watch is Stewart Lee’s Comedy Vehicle. But “Thin Ice” is an episode with words like “privilege” and “whitewash” in its vocabulary, so it’s justified to consider how well the story grapples with these issues. There’s a stylistic choice or two that sit wrong: I could do without Bill gazing approvingly on the Doctor after his big speech, which I suppose more generally fits into the unexplored question of to what extent it matters that the Doctor—and this Doctor more than some, especially in that getup—looks like the embodiment of the very imperialism that produced an odious creature like Lord Sutcliffe. But an episode as great as this can be forgiven an occasional misstep, especially when its larger points are so sound. Does all that make “Thin Ice” derivative? Not at all: It just makes it an episode of a show that has run for 10 seasons, to say nothing of the 26 classic seasons atop which the new series sits. It’s to be expected that stories made more than a decade into a show’s run will echo and rhyme with previous entries, and the question then is how well-executed the story is and to what extent it can find ways to subvert the formula. “Thin Ice” does some of the latter, with both Bill’s assurance to the girl and the Doctor’s big speech failing to have the expected effect. But more generally, “Thin Ice” is just Doctor Who getting out of its own head and cracking out a great episode, one that is alternately funny, adventurous, insightful, and dramatic. Bill Anderson’s direction (and, thankfully, Murray Gold’s score) is solid and unobtrusive in support of the episode’s superlative aspects, Dollard’s script and Capaldi and Mackie’s performances. More than anything else, this episode is just fun, and that’s as good an indicator as any of Doctor Who at its best. For those who want still more Doctor Who discussion, I wanted to let you all know that the podcast Debating Doctor Who is back after a lengthy hiatus (and a shocking and truly heartening number of calls for it to continue). My old cohost Caroline Siede has moved on, but in her stead is fellow A.V. Club contributor and generally brilliant person Allison Shoemaker. Give us a listen, if you fancy. If you’re keeping score at home, I’ve now given full marks to both of Sarah Dollard’s episodes. I know not everyone was as into “Face The Raven” as I was, but damn: Dollard is really, really good at writing Doctor Who episodes. Here’s hoping she proves a mainstay of Chris Chibnall’s tenure, as she may have surpassed “Mummy On The Orient Express” and “Flatline” writer Jamie Mathieson as the breakout writer of the Capaldi era. So, there’s officially something alive (or very much like it) in the Vault. Curiouser and curiouser. I do appreciate that Nardole’s reaction to it is only mostly played for laughs. He’s afraid, but he’s not totally useless before this likely fearsome threat. Yep, that’s right, I dropped my first “A” of the season! Every year, I promise myself I’ll be more cautious and thoughtful and recalibrate my expectations, and then I turn around and bust out the best possible (though not perfect, it should be said) score at the drop of a hat. All of which is to say: Yes, I’m aware of what some of you nice people say about me. I’m at peace with it.